Three or four years ago I stumbled on the book "Quartz Job Scheduling Framework: Building Open Source Enterprise Applications" by "Chuck Cavaness", while browsing the technology section of a Borders bookstore. I remember it peeking my interest. A year or two later, I heard about an open-source version of this engine implemented in .NET called Quartz.NET. This post is for those that want to learn a little bit about Quartz.NET, and/or need a tool to easily implement a cron-job capability, with cron-job scheduling that can be modified at runtime. 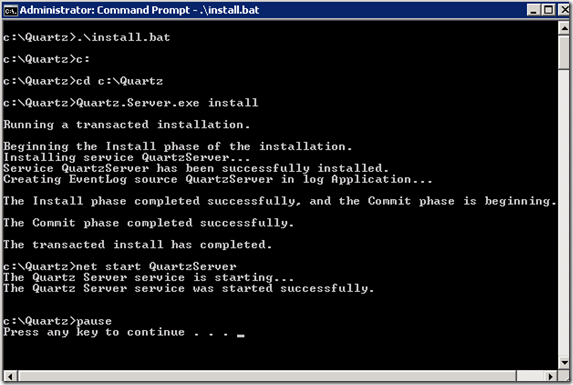 In fact, you don’t need to know anything about Quartz.NET to get up and running with what's in this post. 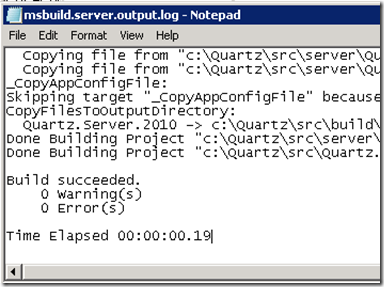 This post is for those that want to learn a little bit about Quartz.NET, and/or need a tool to easily implement a cron-job capability, with cron-job scheduling that can be modified at runtime. In fact, you don’t need to know anything about Quartz.NET to get up and running with what’s below. Three or four years ago I stumbled on the book "Quartz Job Scheduling Framework: Building Open Source Enterprise Applications" by "Chuck Cavaness" while browsing the technology section of a Borders bookstore. I remember it peeking my interest. A year or two later, I heard about an open-source version of this engine implemented in .NET: "Quartz.NET - Enterprise Job Scheduler for .NET Platform". I have since then used this framework on many projects, including some very large global ecommerce projects handling hundreds of thousands of transactions. Needless to say, if you need a lightweight job scheduling framework that really packs a punch, and you have a windows server available, this thing might be perfect for you. If you’re not into windows, use the original version “Quartz Enterprise Job Scheduler”. The core framework took only a week-end to build with Quartz.NET (the plugins took a little longer :-)). With a single plugin that would email me alerts, some custom reports, and just writing custom queries and T-SQL over the database, I had myself a nice little useful tool. Key/value configuration settings can be specified globally, per job, and per plugin. Lower tiers can override settings inherited from a higher tier. 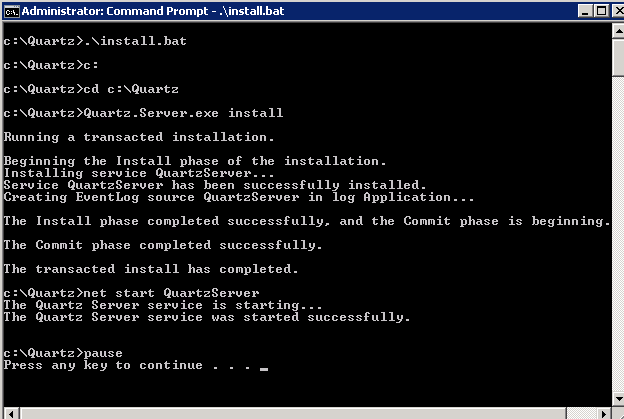 Installing Quartz.NET is a breeze. Everything you need is in the zip file attached to this post. But you can also get the Quartz files directly from sourceforge at: http://sourceforge.net/projects/quartznet/files/quartznet/. I’m using version Quartz.NET 2.0 beta 2 in this post. Step 1 – Extract the contents of the attached zip file into a directory of your choice - I'm using “C:\Quartz\”, then proceed to step 3. If you want to install from the sourceforge download, proceed to step 2. Step 2 – Installing from source. - Extract the contents from the “Quartz.NET-2.0-beta2.zip” file into a directory. I am extracting them into “C:\Quartz\src”. - Open a VS.NET command prompt, and run the following commands: - Check to make sure the log files msbuild.output.log and msbuild.server.output.log both end without any warnings or errors. - Create 2 batch files to easily install and uninstall the Quartz server as a windows service: - Compile the source of the project “Quartz.Server.Extensions.csproj” from the zip file attached to this post or just copy the “Quartz.Server.Extensions.dll” to your Quartz directory - Overwrite the existing quartz_jobs.xml (the new one has the preconfigured Sequential job configuration in it) and quartz.server.exe.config file (this is optional, it just has some additional log4net settings in it) with those from the zip file Step 3 – Start the service Before you start, make sure that paths in the files quartz_jobs.xml, quartz.server.exe.config, install.bat, and uninstall.bat are correct. If you’re following along with this post, you don’t need to do anything. Go to a command prompt (run it as Administrator preferably) and run the install.bat file. To uninstall the service, just run the uninstall.bat file. You’ll now see that your service is running in your services console. 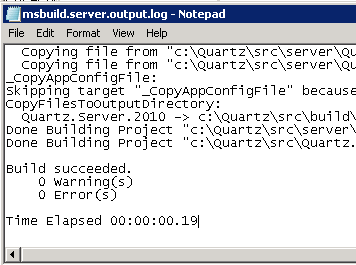 A “logs” directory was created and you can look inside the “quartz.log” file to track what’s going on with your server. Your log file will look like this below. Notice the “ERROR” line, we’ll talk about that next. If you dig into the quartz_jobs.xml file, you’ll see a configuration section that looks like this. This is the job that runs all the plugins. The first xml file - plugins-quartz-config.xml - describes the plugins that are executed. Each job (Sequential Job, not to be confused with a Quartz Job which is inside the quartz_jobs.xml) runs sequentially, and each plugin within the job runs sequentially. Settings can override each other, from top down, starting at the jobs level (across all jobs), job level, and plugin level. These settings are all part of the context parameter passed into the plugin’s “Execute” function. The 2nd file - plugins-quartz-schedule.xml – describes the schedule for the job. These XML files are created as a sample when you run the SequentialJob for the first time. The nice thing about this file, is that it’s constantly changing. To turn off a job, just set the “nextRun” value of the jobId to a future date far into the future. Change the increment and incrementType at any time to change the schedule for this job. /// These are the settings from the plugins-quartz-config.xml file. /// If a setting key at the plugin level exists at a higher level, it will override the higher level key. /// and create business logic based on values inside the Data dictionary. We'll create a sample plugin, as follows. This sample is in the Quartz.Server.Extensions.Plugins.dll file. Let’s just move that file into the plugins directory now, and register it in the plugins-quartz-config.xml file. Sorry george, looks like your comment was cut off. Much better example to play with Quartz.NET in fact its simpler than the official website documentation and tutorial. Thanks Matt. Very cool. Glad it was useful.